Do you want better documentation of your project’s progress? Perhaps you’re interested in improving security on your jobsite, or do you want to be able to manage your projects remotely? Construction cameras applications aren’t limited to simple security but they can be used to verify onsite incidents to limit or prevent litigation, streamline your building process and even be used as marketing material for promotions to impress future clients. The drop in price as the technology becomes cheaper to produce due to economic demand only sweetens what is already a value-packed deal, and as the technology becomes more widely adopted by the industry, the question may not be a matter of if you need a construction camera, but of when you’ll buy one. So why invest in this technology? What can it do to help your business? Here are 6 reasons to invest in construction cameras. This is the first and most common reason for most people to purchase and install a security camera on their jobsite. Even once Reasonable Security has been established, there may be other reasons to invest in a little extra security, and a construction camera might be the perfect solution to those situations where further security measures are needed. Perhaps crime rates have spiked, or a recent theft has ensured the need for further embellishment of security. A construction camera can provide 24-hour a day video footage, even relaying the footage to the internet via a wifi connection. The camera can surreptitiously capture footage of any breaches in your security, and provide evidence for the prosecution of perpetrators. There is also the deterrence factor that a visibly placed camera can provide, and their effectiveness is directly related to their position, says a study by the Campbell Collaboration, which analyzed 44 studies regarding security cameras and their effectiveness. The review shows the effectiveness of cameras in closed areas, like in the case of parking garages or security sites. When managing multiple variables and projects it can be difficult to keep track of all the changes and when they occurred. With a construction camera, these troubles will be relegated to simple checks. For instance, a concrete pour might need several deliverables on a schedule, with a construction camera it’s a simple check of the latest image on schedule to ensure the deliverables are timely. Even if your main focus is security or documentation the footage recorded during the project by the construction camera can be used to create impressive time lapse videos of your project that make for engaging promotional video content for marketing purposes. With only a little preparation you can ensure your construction camera can double as a time lapse camera, and use the resulting video to excite and wow your potential clients. Nothing says efficiency and professionalism like seeing a complex project rise from the ground to completion in under a minute. Managing a construction project is a complex task at the best of times, life can get in the way and mean that you aren’t always around to manage the site directly. With the help of a construction camera, however, you can manage your project remotely by directly accessing the camera’s live feed or its older footage. With simple software, you can check the progress of deliverables and milestones, and relay any communication necessary via phone or email. With the aid of a construction camera, one is afforded a bird’s-eye view of the project, and multiple cameras or positions can help you to make the most of this unique position. With a simple glance, you can see the progress of multiple deliverables and milestones. If this is coupled with project management software the building process can be streamlined significantly; reducing the need for boots-on-ground checks, walkthroughs, and updates. The time savings alone can make construction cameras worth the investment. When incidents occur that put you or your company at risk of litigation having video evidence of the incident can prove invaluable. Spurious claims are made against employers every year and video evidence can settle the case simply. If materials or tools go missing it is simple to verify when and who removed them, offering the potential for direct reparations before involving your company in costly court proceedings. 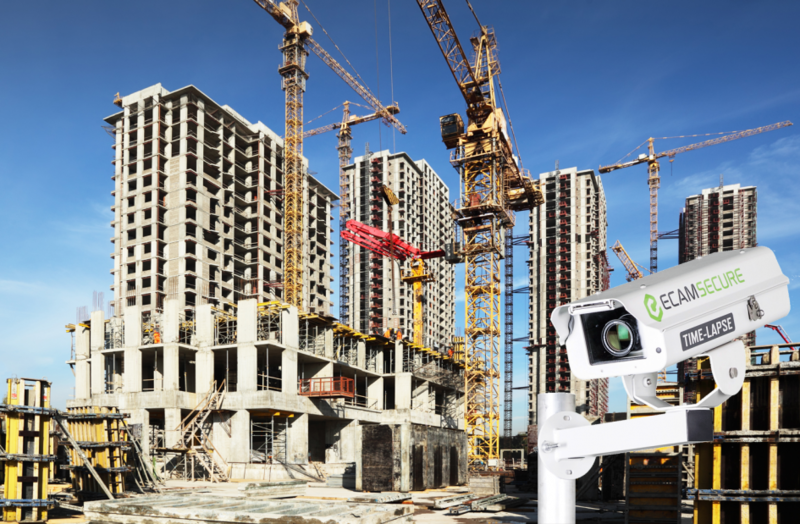 Construction cameras and their accompanying software are a powerful tool against theft, time wastage, unimpressive marketing materials and more. Interested in how these tools might help your company? Contact us now for a free quote.